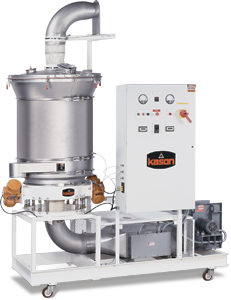 A new Double-Deck, Circular Vibratory Fluid Bed Processor from Kason Corporation significantly reduces capital cost, energy usage and floor space per pound of product being dried or cooled according to Lawrence Stone, CEO. "The addition of an upper deck makes use of heated or cooled air that would otherwise be exhausted after passing through the lower deck, and requires little to no increase in the size or energy consumption of imbalanced-weight motors or blower fans, nearly doubling capacity and efficiency with little to no increase in operating cost or floor space," says Stone. vibration, circular fluid bed processors are inherently rigid, allowing materials of construction to be down-gauged and vibratory motors to be downsized. Associated components are also eliminated, such as multiple air inlets and outlets and their associated ducting — the circular unit requiring only one of each. The result, claims Stone, is a unit of significantly lighter weight and higher operating efficiency, with lower capital cost and a smaller footprint, than rectangular fluid bed processors of equivalent bed area and capacity. Reductions in material, weld seams, and associated labor decrease fabrication cost, particularly when units are finished to FDA, USDA, BISSC or 3-A standards. With reduced weld seams, a quick-disconnect housing, and no internal cross-members, circular fluid bed processors cut cleaning time dramatically. Four models of the patent pending, double-deck fluid bed processor range in diameter from 48" to 84" (1220mm to 2135mm), satisfying medium- to high-volume production requirements. All are available configured for continuous drying, cooling or moisturizing applications.